myDevices, Inc. today announced the availability of turnkey Internet of Things (IoT) solutions, in partnership with the IoT Business Unit of Alibaba Cloud, the cloud computing arm of Alibaba Group. 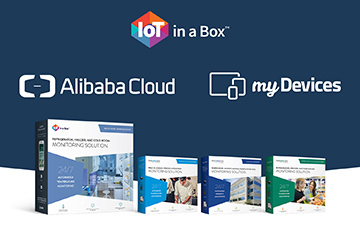 myDevices will market and sell IoT in a Box™ solutions in China through Alibaba Cloud’s existing reseller distribution network. These remote monitoring solutions protect important assets for small businesses and large enterprise customers across a wide variety of industries for use cases in the commercial refrigeration and facility management vertical markets. Registered reseller partners will benefit from extensive training opportunities and will have access to a library of sales and marketing materials that will support their outreach with existing and new customers. myDevices will work closely with the Alibaba Cloud team to offer sample use cases, how-to videos, ROI calculators, prospecting checklists, and marketing materials through a Reseller Portal dedicated to supporting Alibaba’s reseller distribution network. IoT in a Box solutions are created by mixing-and-matching gateways and sensors from a multitude of device manufacturers. This venture also enables Alibaba Cloud’s new and existing ecosystem of hardware manufacturing partners to integrate their devices into the ever-growing list of compatible sensors and gateways through the myDevices IoT Ready Program. By incorporating their hardware, these devices become immediately available in China and overseas for the creation of finished solutions for any use case. The post Alibaba Cloud and myDevices Partner to Launch Turnkey IoT Solutions in China appeared first on IoT Business News.